The metabotropic glutamate 5 receptor and the cannabinoid type 1 receptor are G protein–coupled receptors that are widely expressed in the central nervous system. Metabotropic glutamate 5 receptors, present at the postsynaptic site, are coupled to Gαq/11 proteins and display an excitatory response upon activation, whereas the cannabinoid type 1 receptor, mainly present at presynaptic terminals, is coupled to the Gi/o protein and triggers an inhibitory response. 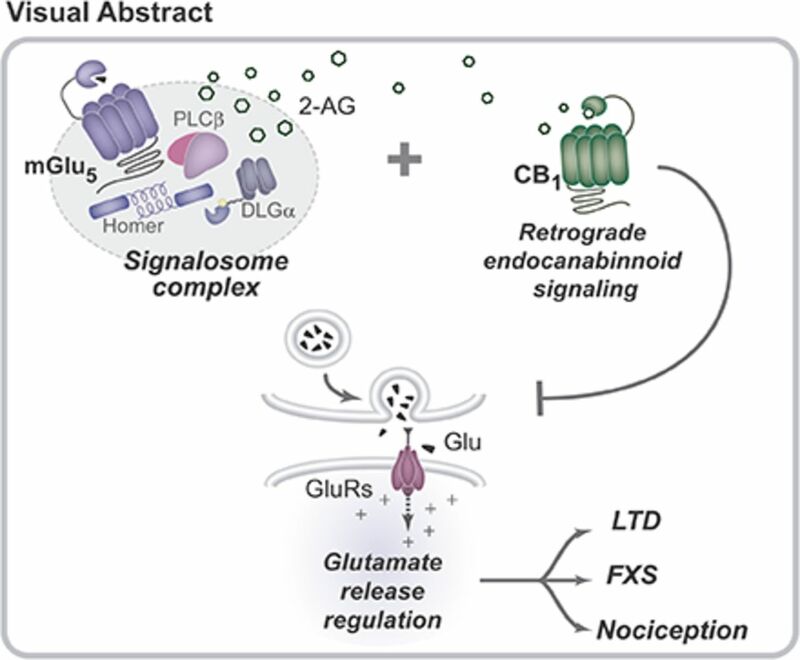 Recent studies suggest that the glutamatergic and endocannabinoid systems exhibit a functional interaction to modulate several neural processes. In this review, we discuss possible mechanisms involved in this crosstalk and its relationship with physiologic and pathologic conditions, including nociception, addiction, and fragile X syndrome. 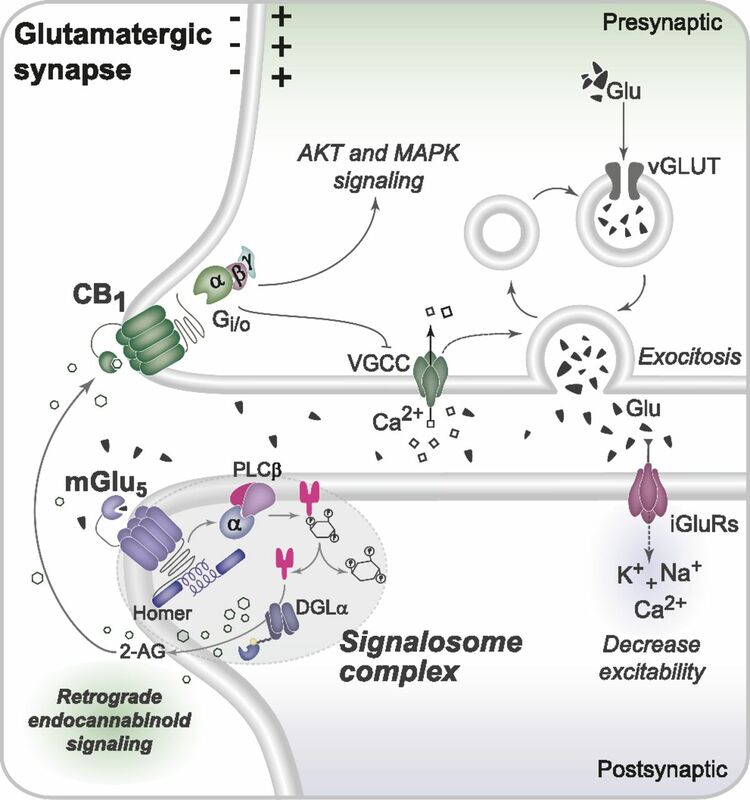 Glutamate, the most important excitatory neurotransmitter in the central nervous system (CNS) of mammals, modulates several neural events, including development and cognition, as well as neurologic pathogenesis. Glutamate exerts its actions by binding and activating glutamatergic receptors, which are classified into two distinct groups: ionotropic glutamatergic receptors and metabotropic glutamatergic receptors (mGlu receptors). The ionotropic glutamatergic receptors are ligand-gated ion channels and are subdivided into three types: N-methyl-d-aspartate receptors (NMDARs), α-amino-3-hydroxy-5-methyl-4-isoxazolepropionate (AMPA) receptors, and kainate receptors (Karakas et al., 2015). mGlu receptors are G protein–coupled receptors that can trigger cell signaling transduction pathways through intracellular second messengers to modulate synaptic activity. Eight different mGlu receptors are subdivided into three groups (I, II, and III) based on signal transduction, sequence homology, and pharmacological properties (Nakanishi, 1992). Group I includes the mGlu1 and mGlu5 receptors, which mediate excitatory responses through the activation of phosphoinositide signaling pathways, and group II and III receptors, which inhibit the cAMP signaling pathway (Nakanishi, 1992). Several studies indicate that the mGlu5 receptor is central to various brain processes, including long-term potentiation and long-term depression (LTD), mechanisms important for memory acquisition and learning (Bliss and Collingridge, 1993; Sung et al., 2001; Hou and Klann, 2004; Hullinger et al., 2015). Moreover, relevant neuronal processes such as cell differentiation, plastic alterations, and cell death are also modulated by mGlu receptors (Sheng and Kim, 2002; Erichsen et al., 2015). The mGlu5 receptor exhibits a three-dimensional structure commonly observed among mGlu receptor family members, including a large extracellular amino-terminal portion where the orthosteric site is located, a transmembrane heptahelical domain that contains an allosteric binding site, and an intracellular C-terminal portion (Nakanishi and Masu, 1994). The mGlu5 receptor is broadly expressed in the CNS and is predominantly located perisynaptically near postsynaptic elements and in glial cells (Shigemoto et al., 1993; Nusser et al., 1994; Lujan et al., 1996; Cai et al., 2000). Notably, the mGlu5 receptor is expressed in different brain regions, including the olfactory bulb, anterior olfactory nuclei, olfactory tubercle, cerebral cortex, hippocampus, septum side, striatum, nucleus accumbens, inferior colliculus, and spinal trigeminal nuclei (Abe et al., 1992). mGlu5 receptors can activate multiple cell signaling pathways (Fig. 1). The classic canonical form of the mGlu5 receptor signaling starts with glutamate binding to the orthosteric site of the receptor. 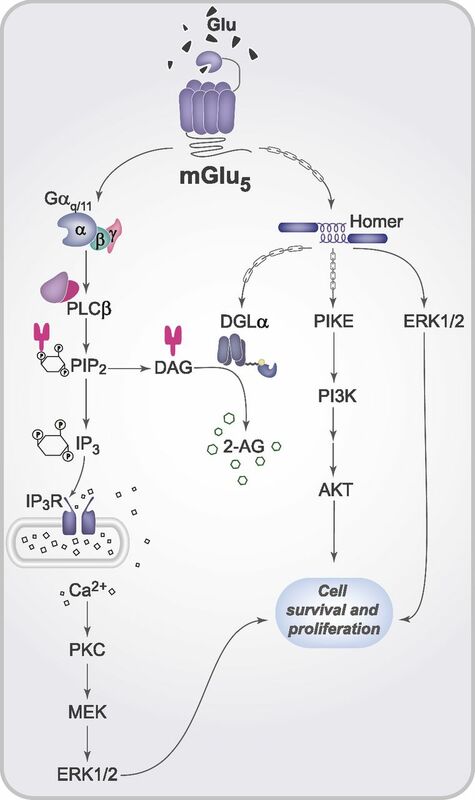 The ligand/receptor interaction induces Gαq/11 protein activation, which leads to the activation of phospholipase C (PLC)-β and the formation of second messengers, including diacylglycerol (DAG) and inositol 1,4,5-trisphosphate (IP3). IP3 binds to its receptor in the endoplasmic reticulum (IP3R), and this leads to an increase in intracellular Ca2+ levels and consequent activation of protein kinase C (Berridge and Irvine, 1984). Simultaneously, protein kinase C activation drives mGlu5 receptor desensitization through phosphorylation (Alaluf et al., 1995; Dhami and Ferguson, 2006; Ribeiro et al., 2009, 2010). Cell signaling pathways activated by the mGlu5 receptor. The scheme illustrates an overview of mGlu5 receptor cell signaling pathways. After glutamate binding, the mGlu5 receptor is stimulated and promotes G-protein dissociation, which activates PLCβ and leads to DAG cleavage and formation of the second messengers IP3 and DAG. IP3 binds to and stimulates IP3Rs, increasing intracellular Ca2+ levels and contributing to ERK1/2 activation. In addition, the C-terminal portion of the mGlu5 receptor can interact with Homer proteins that interact with other protein partners to trigger various biologic cascades such as formation of the endocannabinoid 2-AG and phosphorylation of AKT and ERK1/2. Moreover, activation of these distinct pathways underlies important biologic processes, including cell proliferation and survival. Protein–protein interactions are represented by arrow-chains and activated elements are represented by continuous arrows. Glu, glutamate; MEK, mitogen-activated protein kinase kinase; PIKE, phosphoinositide 3-kinase enhancer. mGlu5 receptor activation can facilitate its interaction with postsynaptic proteins, triggering the activation of other cell signaling cascades (Tu et al., 1999). Homer-type proteins are mainly postsynaptic, acting as scaffold proteins and binding directly to the C-terminal portion of the mGlu5 receptor (Brakeman et al., 1997). Notably, Homer proteins appear to be involved in the anchorage and distribution of mGlu 5 receptor at the periphery of the synapse and in the expression of mGlu5 receptors at the plasma membrane (Roche et al., 1999; Ango et al., 2002; Mansouri et al., 2015). Moreover, mGlu5/Homer interaction may also interfere with the regulation of synaptic transmission, because previous studies show that NMDAR activity is controlled by the mGlu5 receptor through the protein complex formed by Homer (Moutin et al., 2012). Moreover, Homer proteins may control spontaneous activity of group I mGlu receptors (Ango et al., 2001). Homer proteins are widely expressed in neurons and form complexes with postsynaptic density proteins to facilitate the interaction between plasma membrane receptors and intracellular signal transduction components (Xiao et al., 1998; Shiraishi-Yamaguchi and Furuichi, 2007). For example, Homer binding to IP3Rs brings the mGlu5 receptor into close proximity, facilitating the activation of IP3Rs and the release of Ca2+ from intracellular stores (Tu et al., 1998). mGlu5 receptor activation can trigger phosphorylation of extracellular signal-regulated kinases (ERK1/2) and part of this effect is attributable to signaling mediated by IP3/Ca2+ (Mao et al., 2005; Wang et al., 2007; Jong et al., 2009). However, it has been shown that Homer establishes an alternative signaling pathway linking the mGlu5 receptor to ERK1/2 in a Ca2+-independent manner (Fig. 1) (Mao et al., 2005). Moreover, both IP3/Ca2+- and Homer-dependent cascades are necessary to activate ERK1/2 to levels high enough to phosphorylate the transcription factors ETS domain-containing protein-1 and cAMP response element-binding protein, facilitating the expression of genes involved in cell proliferation (Mao et al., 2005). It has also been shown that activation of the mGlu5 receptor in mouse hippocampal slices results in phosphoinositide 3-kinase (PI3K)–dependent protein kinase B (AKT) phosphorylation (Hou and Klann, 2004; Ribeiro et al., 2010). The mechanism underlying mGlu5-dependent AKT activation has been elucidated, and it has been reported that activation of mGlu receptors enhances formation of the complex mGlu5 receptor, Homer, and PI3K enhancer, which leads to activation of PI3K (Rong et al., 2003). PI3K increases the levels of phosphatidylinositol 3,4,5-trisphosphate, facilitating the recruitment of pyruvate dehydrogenase kinase 1 (PDK1) and AKT to the cell membrane, where AKT is phosphorylated by pyruvate dehydrogenase kinase 1 (Burgering and Coffer, 1995; Rong et al., 2003). AKT activation triggers important downstream signaling events, such as apoptosis inhibition and transcription activation of genes involved in cell proliferation and survival (Song et al., 2005). Various synthetic ligands were found to interact with the mGlu5 receptor, facilitating the understanding of many different downstream signaling effects triggered by this receptor. 3,5-Dihydroxyphenylglycine (DHPG) is an orthosteric ligand that can activate both mGlu5 and mGlu1 receptors (Ito et al., 1992; Fitzjohn et al., 1996). Further studies led to the discovery of (RS)-2-chloro-5-hydroxyphenylglycine (CHPG), which was at first proposed as a mGlu5 receptor–selective agonist but was shown to also activate mGlu1 receptors (Doherty et al., 1997; Kammermeier, 2012). Another class of compounds that act as positive allosteric modulators can bind to an allosteric regulatory site that is topographically distinct from the conserved orthosteric agonist binding site, and they can thus be more selective for the different mGlu receptor subtypes since the allosteric site is weakly conserved (Sheffler et al., 2011). Interestingly, the mGlu5 receptor positive allosteric modulator, 3-cyano-N-(1,3-diphenyl-1H-pyrazol-5-yl)benzamide (CDPPB), can activate neuroprotective cell signaling pathways without increasing intracellular Ca2+ (Doria et al., 2013). Moreover, CDPPB can rescue neuronal cell death, abrogate huntingtin aggregation, and prevent memory deficit in a mouse model of Huntington disease (Doria et al., 2015). The widely used mGlu5 receptor inhibitor 2-methyl-6-(phenylethynyl)-pyridine (MPEP) is a negative allosteric modulator, inhibiting the hydrolysis of phosphoinositides (Gasparini et al., 1999). MPEP can act as an inverse agonist of the mGlu5 receptor, inhibiting its constitutive activity (Gasparini et al., 1999; Pagano et al., 2000). In the same way, another potent selective mGlu5 receptor inhibitor is 3-[(2-methyl-1,3-thiazol-4-yl)ethynyl]-pyridine (MTEP), which shows higher affinity for the receptor and higher solubility in water compared with MPEP (Cosford et al., 2003). Recent studies report that 2-chloro-4-((2,5-dimethyl-1-(4-(trifluoromethoxy)phenyl)-1H-imidazol-4-yl)ethynyl)pyridine (CTEP), a negative allosteric modulator with inverse agonist activity, is orally bioavailable and has in vivo affinity properties that are 30- to 100-fold higher than MPEP (Lindemann et al., 2011). Examples of mGlu5 receptor synthetic ligands are presented in Table 1. The search for the mechanism of action of the main psychoactive component of the herb Cannabis sativa (hemp), Δ9-tetrahydrocannabinol, and its synthetic cannabinoid derivatives led to the discovery of the endogenous cannabinoid system (Mechoulam and Gaoni, 1967; Paton, 1975; Bisogno et al., 2005; Wang and Ueda, 2009). The endocannabinoid system comprises at least two endogenous ligands (endocannabinoids), the biochemical machinery for endocannabinoid synthesis and degradation, and the cannabinoid receptors, which include the cannabinoid type 1 (CB1) receptor, the cannabinoid type 2 receptor, and possibly others (Mechoulam et al., 1995; Piomelli, 2003; Di Marzo et al., 2004; Di Marzo, 2008). CB1, a Gi/o-coupled receptor, is abundantly expressed in the mammalian CNS and is mainly located at the presynaptic sites of neurons of the basal ganglia, cerebellum, hippocampus, certain regions of the cerebral cortex, ventral striatum, amygdala, periaqueductal gray (PAG) matter, and hypothalamic nuclei (Herkenham et al., 1990; Matsuda et al., 1990). The major endogenous ligands of the cannabinoid receptors are arachidonoyl ethanolamide (AEA; also termed anandamide) and 2-arachidonoyl glycerol (2-AG) (Devane et al., 1992; Mechoulam et al., 1995). Besides AEA and 2-AG, other ligands have been proposed (Bisogno et al., 2000; Hanus et al., 2001; Huang et al., 2002; Porter et al., 2002). Unlike other mediators, AEA and 2-AG are not stored in the CNS, but they act as retrograde messengers that are synthesized and released in an activity-dependent manner, after changes in cellular homeostasis (Wilson and Nicoll, 2001; Marsicano et al., 2003; Di Marzo and Matias, 2005). Increased Ca2+ levels can augment endocannabinoid synthesis, in part because their biosynthetic enzymes are sensitive to Ca2+ concentration levels (Di Marzo, 2009). Endocannabinoids are generally inactivated by mechanisms involving carrier-mediated transport into the cell and intracellular hydrolysis (Piomelli, 2003). Because AEA and 2-AG are lipophilic molecules, they can diffuse through the lipid membranes of both neurons and glia using carrier-mediated transport by facilitated diffusion (Beltramo et al., 1997; Hillard et al., 1997; Piomelli, 2003). AEA is metabolized into arachidonate and ethanolamine by the enzyme fatty acid amide hydrolase (FAAH) and 2-AG in arachidonate and glycerol via monoacylglycerol lipase (MAGL) (Piomelli, 2003; Di Marzo and Petrosino, 2007). Evidence also suggests that FAAH can catalyze 2-AG hydrolysis (Di Marzo and Deutsch, 1998; Bisogno et al., 2005). Since FAAH is present at cell bodies and dendrites of principal neurons and MAGL is located at axon terminals, it has been proposed that AEA and 2-AG degradation occurs at the post- and presynaptic neuron, respectively (Tsou et al., 1998; Dinh et al., 2002; Egertová et al., 2003). CB1 receptor activation influences multiple effector systems; because of its wide distribution in the brain, the CB1 receptor is believed to be responsible for mediating the majority of the cannabinoids’ effects in the CNS (Cabral and Marciano-Cabral, 2005; Di Marzo, 2009). Evidence obtained by multiple groups supports the hypothesis that the CB1 receptor plays a key role in various cellular events (Ferreira-Vieira et al., 2014; Gomez et al., 2015; Zhang et al., 2015). Moreover, it has been reported that the CB1 receptor is involved in cognitive and affective processes, as well as in the control of motor activity, stress, addiction, and neuroprotection (Nagayama et al., 1999; Broadbent et al., 2004; Finn, 2010; Naydenov et al., 2014; McReynolds et al., 2016). Given its presynaptic location, it has been proposed that the CB1 receptor can regulate neurotransmitter release and thus modulate synaptic plasticity by facilitating LTD (Wilson and Nicoll, 2001; Gerdeman et al., 2002; Marsicano et al., 2002; Robbe et al., 2002). The effect of CB1 receptor activation on synaptic plasticity can occur through the inhibition of presynaptic voltage-gated Ca2+channels, including N- and P/Q-type channels, or by the activation of A-type and inwardly rectifying K+ channels (Felder et al., 1993; Twitchell et al., 1997; Howlett et al., 2002; Wilson and Nicoll, 2002; Piomelli, 2003). CB1 receptor stimulation activates multiple signal transduction pathways through the Gi/o family of G proteins (Fig. 2). Usually, CB1 receptor activation modulates both adenylate cyclase and mitogen-activated protein kinase (MAPK) activity. The classic effect of a CB1 receptor agonist is the inhibition of adenylate cyclase activity and reduction of cAMP production, which has been demonstrated in several conditions (Felder et al., 1993; Vogel et al., 1993; Childers et al., 1994). CB1 receptor agonists induce MAPK phosphorylation and MAPK activation, which suggests that the CB1 receptor can modulate gene transcription (Bouaboula et al., 1995; Patel et al., 1998). Furthermore, MAPK regulates key cellular processes (e.g., cellular proliferation and survival) that may be mediated by the CB1 receptor (Aguado et al., 2006, 2007). Other effects attributed to the CB1 receptor appear to involve activation of the PI3K/AKT pathway (Molina-Holgado et al., 2002; Ozaita et al., 2007). Activation of the anandamide/CB1/PI3K pathway was recently reported to protect rat brains from cocaine-induced neurotoxicity (Vilela et al., 2015). Cell signaling pathways triggered by CB1 receptor activation. 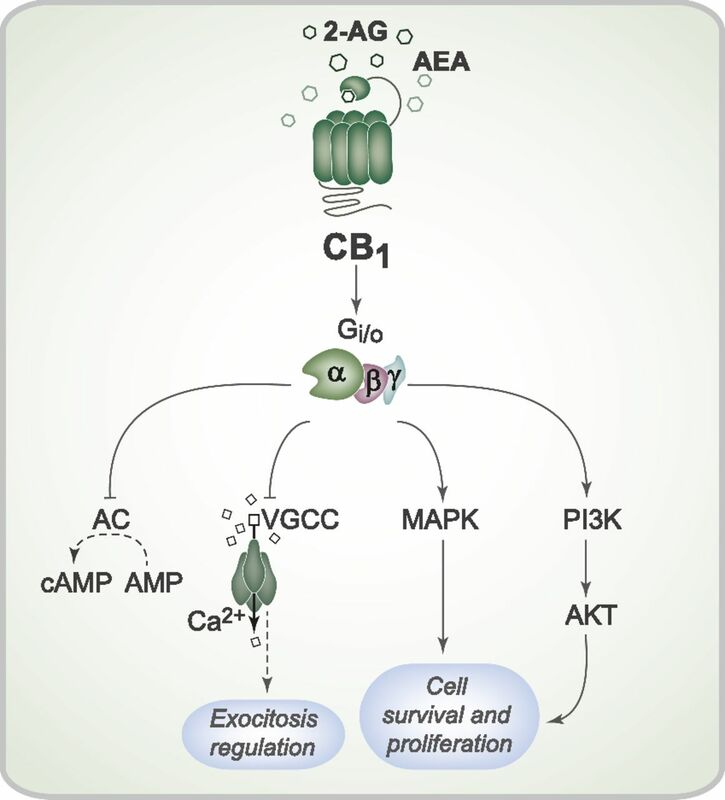 Activation of the CB1 receptor by the endocannabinoids 2-AG and AEA can initiate a series of intracellular events mediated by the Gi/o protein. CB1 receptor activation can inhibit adenylate cyclase activity and therefore modulate cAMP production. CB1 receptor activation also promotes closure of the voltage-gated Ca2+ channel, which can reduce Ca2+ entry into the presynaptic neurons and interfere with synaptic vesicle exocytosis and neurotransmission. Furthermore, CB1 receptor stimulation can induce both MAPK and AKT phosphorylation and activation, which regulate proliferation and cell survival. AC, adenylate cyclase; VGCC, voltage-gated Ca2+ channel. Some evidence indicates that pharmacological manipulation of the cannabinoid system can alleviate symptoms of several conditions, including addiction, seizures, neurodegenerative disease, and nociception (Adamczyk et al., 2009; Almeida-Santos et al., 2013; Pietropaolo et al., 2015; Vilela et al., 2015; Wolkers et al., 2015). For example, treatment with a CB1 receptor agonist, WIN 55,212-2 [(R)-(+)-[2,3-dihydro-5-methyl-3-4-morpholinylmethyl)pyrrolo[1,2,3,-de]-1,4-benzoxazin-6-yl]-1-naphthalenylmethanone mesylate], prevented the appearance of motor deficits, decreased the number of striatal huntingtin inclusions, and rescued striatal medium-sized spiny neurons loss in a Huntington disease mouse model (Pietropaolo et al., 2015). Positive results have also been found in Alzheimer and Parkinson disease mouse models (Price et al., 2009; Aso et al., 2012; Cao et al., 2014). Other synthetic compounds, termed indirect agonists, are of therapeutic value for their ability to potentiate the action of endogenous ligands in a controlled manner by blocking metabolism or uptake of endocannabinoids. For instance, we demonstrated that URB597 (cyclohexyl carbamic acid 3′-carbamoyl-biphenyl-3-yl ester), an FAAH inhibitor, reduces cocaine-induced seizures and epileptiform electroencephalographic activity in rats (Vilela et al., 2015). Similarly, JZL-184 (4-nitrophenyl-4-[bis(1,3-benzodioxol-5-yl)(hydroxy)methyl]piperidine-1-carboxylate), an MAGL inhibitor, increases the levels of 2-AG, which reduces and delays the development of generalized seizures in a kindling model of temporal lobe epilepsy (von Rüden et al., 2015). Other effects, such as an increase in brain-derived neurotrophic factor levels, cellular proliferation, and neurogenesis, have also been reported with the use of cannabinoid receptors as indirect agonists (Ferreira-Vieira et al., 2014; Gomez et al., 2015; Zhang et al., 2015). See Table 2 for more examples of synthetic ligands of the endocannabinoid system. mGlu5 and CB1 receptors exhibit a close relationship, because one receptor can regulate the activation of the other (Fig. 3). CB1 receptor activation leads to decreased Ca2+ channel activity, which limits glutamate release and suggests that the CB1 receptor might regulate the amount of glutamate available to activate mGlu5 receptors (Shen et al., 1996; Wilson and Nicoll, 2001; Marsicano et al., 2003). On the other hand, mGlu receptor activation can facilitate endocannabinoid synthesis. For example, mGlu 1 receptor stimulation in cerebellar Purkinje cells can enhance endocannabinoid synthesis (Maejima et al., 2001). Moreover, stimulation of group I mGlu receptors, especially the mGlu5 receptor, in hippocampal CA1 cells also leads to increased cannabinoid production (Varma et al., 2001; Ohno-Shosaku et al., 2002). A rise in postsynaptic Ca2+ due to neuronal stimulation increases cannabinoid synthesis, which can be prevented when calcium chelators such as EGTA or 1,2-bis(o-aminophenoxy)ethane-N,N,N′,N′-tetraacetic acid are present postsynaptically (Llano et al., 1991; Pitler and Alger, 1994). However, mGlu receptor activation by DHPG can augment the depolarization-induced release of endocannabinoids without increasing intracellular Ca2+ levels (Ohno-Shosaku et al., 2002). Thus, it is possible that the mGlu5 receptor might rely on other mechanisms to increase endocannabinoid synthesis. More recently, it has been demonstrated that the mGlu5 receptor is part of the 2-AG signalosome (Fig. 3), which was first identified at excitatory synapses of the ventral striatum and prefrontal cortex and was later found in other regions of the mammalian CNS (Katona et al., 2006; Mátyás et al., 2008; Nyilas et al., 2009; Jung et al., 2012). This supramolecular complex contains Homer proteins, which bind to the mGlu5 receptor and to the two key enzymes responsible for 2-AG synthesis, PLCβ and diacylglycerol lipase (DGL)-α (Katona et al., 2006; Jung et al., 2007, 2012). mGlu5 receptor stimulation leads to PLCβ activation and formation of DAG, which can be rapidly converted into 2-AG because of the close proximity of the enzyme DGLα. Because the 2-AG signalosome is restricted to excitatory synapses, this increase in 2-AG synthesis mainly underlies a suppression of presynaptic glutamate release that can be important for preventing excitotoxicity but can also decrease excitability (Lafourcade et al., 2007; Huang et al., 2008; Katona and Freund, 2008). Functional interaction between mGlu5 and CB1 receptors: the signalosome complex. At glutamatergic synapses, mGlu5 receptor intracellular domains interact with Homer protein, which is a scaffold protein that is important for assembling the complex known as the signalosome. This signalosome complex, which is located at the perisynapse, brings the mGlu5 receptor into close proximity to the two key enzymes responsible for 2-AG synthesis, PLCβ and DGLα, because Homer proteins bind to the mGlu5 receptor, PLCβ and DGLα. Thus, mGlu5 receptor stimulation leads to the activation of PLCβ and formation of IP3 and DAG, which is metabolized to 2-AG by DGLα. 2-AG moves across the synaptic cleft and activates the CB1 receptor, located at the presynaptic terminal. Activation of CB1 inhibits the voltage-gated calcium channel, reducing the influx of Ca2+ and, consequently, reducing glutamatergic vesicle exocytosis. The result of mGlu5 and CB1 receptor signaling crosstalk is the regulation of postsynaptic neurons excitability. Activated elements are represented by continuous arrows, inhibition is represented by blocked arrows and reduced activity of the biologic process is represented by the dashed arrow. The protein complex depicted in the dashed area, named the signalosome complex, is located at the plasma membrane of the perisynaptic region. Glu, glutamate; iGluR, ionotropic glutamate receptor; VGCC, voltage-gated calcium channel; vGLUT, vesicular glutamate transporter 1. LTD is a type of synaptic plasticity that likely contributes to learning and memory and can be triggered by activation of NMDARs and mGlu receptors (Dudek and Bear, 1992; Fitzjohn et al., 1999; Kemp and Manahan-Vaughan, 2004). LTD can be induced by DHPG and it has been shown that the mGlu5 receptor is the key mGlu receptor to trigger LTD (Liu et al., 1993; Palmer et al., 1997; Huber et al., 2001). Notably, mGlu5 receptor stimulation can trigger LTD in both excitatory and inhibitory synapses by mobilizing endocannabinoids. It has been shown that repetitive activation of presynaptic glutamatergic fibers can induce mGlu-dependent LTD of hippocampal inhibitory synapses in the CA1 area via retrograde cannabinoid signaling (Chevaleyre and Castillo, 2003). In addition, mGlu5-dependent LTD via mobilization of endocannabinoids, especially 2-AG, also takes place at excitatory synapses in the visual and prefrontal cortex (Lafourcade et al., 2007; Huang et al., 2008) as well as in the Schaffer collateral pathway (Izumi and Zorumski, 2012). The mGlu5 receptor can also trigger LTD in a mechanism that is dependent on protein synthesis and might also involve the CB1 receptor (Weiler and Greenough, 1993; Huber et al., 2002). This type of mGlu5/CB1-induced long-term potentiation is further discussed in the section below on the role of CB1/mGlu5 in fragile X syndrome (FXS). The cooperative actions triggered by mGlu5 and CB1 receptors to induce LTD indicate that these two receptors might be important in various physiologic processes, including memory and addiction. Indeed, CB1 and mGlu5 receptors appear to be involved in cocaine addiction, because a single exposure of mice to cocaine increases expression of Homer, reduces mGlu5 receptor plasma membrane expression, and abolishes retrograde LTD mediated by endocannabinoids (Fourgeaud et al., 2004). FXS, the most common cause of inherited intellectual disability, is caused by the silencing of the fragile X mental retardation 1 (FMR1) gene with consequent expression arrest of the fragile X mental retardation protein (FMRP), an RNA-binding protein important for translation regulation (Verkerk et al., 1991; Darnell et al., 2011). It has been demonstrated that the mGlu5 receptor plays an important role in FXS (Bear et al., 2004; Michalon et al., 2012). Activation of group I mGlu receptors leads to protein synthesis–dependent establishment of LTD, which is enhanced in the absence of FMRP expression (Weiler and Greenough, 1993; Huber et al., 2002). Consistent with these studies, coupling between mGlu receptor activation and endocannabinoid mobilization is enhanced at CA1 GABAergic synapses of FMR1 knockout mice, leading to augmented endocannabinoid-mediated LTD and increased neuronal excitability (Zhang and Alger, 2010). Similarly, in the FMR1 knockout mice dorsal striatum, mGlu5-mediated endocannabinoid activity at GABAergic synapses is increased (Maccarrone et al., 2010). At excitatory synapses of the frontal cortex and ventral striatum, FMRP deletion promotes disorganization of the 2-AG signalosome, marked deficits in mGlu5-mediated 2-AG release, and diminished endocannabinoid-dependent, protein synthesis–independent LTD (Jung et al., 2012). Homer binding to DGLα is altered at excitatory synapses of FMR1 knockout mice, which leads to misplacement of DGLα in the cell and disruption of the 2-AG signalosome, although no alterations in DGLα localization have been observed at inhibitory synapses (Jung et al., 2012). Thus, LTD can be differentially regulated by FMRP, depending on whether it takes place at excitatory or inhibitory synapses. Supporting this hypothesis, when Homer interactions were disrupted by a peptide that binds to long Homers, hippocampal slices from both wild-type and FMR1 knockout mice became more excitable due to enhanced mGlu5-dependent endocannabinoid mobilization at GABAergic synapses, although endocannabinoid mobilization by mGlu5 receptors was decreased at excitatory synapses (Tang and Alger, 2015). Interestingly, antagonism of CB1 receptor activity prevented the development of hyperexcitability in both FMR1 knockout and membrane-permeable Homer CT peptide models (Busquets-Garcia et al., 2013; Tang and Alger, 2015). However, pharmacological enhancement of 2-AG levels by JZL184 normalized endocannabinoid-mediated LTD and corrected key behavioral abnormalities in FMR1 knockout mice (Jung et al., 2012). Thus, it is currently unclear whether CB1 receptor blockage or activation could be beneficial in FXS. The analgesic effect of cannabinoids in the CNS is mainly mediated by CB1 receptor expression in neural substrates involved in nociceptive neurotransmission, including the spinal dorsal horn, PAG, dorsal raphe nuclei, and thalamic ventroposterolateral nucleus (Martin et al., 1995). Group I mGlu receptors can modulate nociceptive responses in the spinal cord, ventrobasal thalamus, dorsal raphe, amygdala, and PAG (Young et al., 1997; Hama, 2003; Palazzos et al., 2006). Importantly, it has been shown that mGlu5 and CB1 receptors exhibit a functional interaction to modulate nociception in some of these brain substrates. The midbrain PAG is the most extensively studied supraspinal area involved in the modulation of nociception. Interestingly, it has been shown that the mGlu5 receptor is able to exert a tonic modulation of nociception promoted by microinjections of WIN 55,212-2 in the PAG, which increases nociceptive response latency in the plantar test (Palazzo et al., 2001). Moreover, under neuropathic pain conditions, PAG cannabinoid-induced antinociception requires downstream activation of the mGlu5 receptor (de Novellis et al., 2005; Palazzo et al., 2012). The mechanism underling mGlu5/CB1 cooperation at the PAG to promote analgesia has been identified, because a previous study demonstrated that mGlu5 receptor stimulation in PAG slices leads to 2-AG mobilization and retrograde inhibition of GABAergic transmission, which produces analgesia (Drew et al., 2008). Corroborating these data, microinjection of DHPG into the dorsolateral PAG triggered the release of 2-AG and enhanced stress-dependent antinociception (Gregg et al., 2012). This effect was reversed by pharmacologically blocking DAGLα or reducing expression through small interfering RNA silencing (Gregg et al., 2012). Moreover, immunohistochemical analysis demonstrated that, at the PAG, the mGlu5 receptor colocalizes with DAGLα at the postsynaptic terminals in a location juxtaposed to the presynaptic localization of CB1 receptors, which suggests that the postsynaptic mGlu5-DAGLα cascade can trigger retrograde 2-AG signaling in the PAG to promote analgesia (Gregg et al., 2012). Since the mGlu5 receptor is mostly present perisynaptically, spillover glutamate is the main endogenous mechanism to activate this receptor at the PAG region (Nusser et al., 1994; Drew et al., 2008). For example, neuronal inhibition of glutamate transporters in PAG slices enhanced mGlu5-mediated depression of GABAergic synaptic transmission through a CB1-dependent mechanism (Drew et al., 2008). In addition, capsaicin and anandamide can activate transient receptor potential vanilloid receptor 1 and induce substantial glutamate release in the ventrolateral PAG to stimulate mGlu5-dependent 2-AG mobilization and analgesia (Maione et al., 2006; Starowicz et al., 2007; Kawahara et al., 2011; Liao et al., 2011). Moreover, several analgesic neuropeptides can trigger 2-AG mobilization via mGlu5 receptor stimulation by exciting glutamatergic cell bodies. It has been shown that substance P, neurotensin, and cholecystokinin can stimulate neurokinin 1, neurotensin 1/2, and cholecystokinin 1 receptors, respectively, on glutamatergic somas. This triggers glutamate release and leads to activation of perisynaptic mGlu5 receptors with consequent PAG disinhibition through 2-AG mobilization (Drew et al., 2009; Mitchell et al., 2009, 2011). Future studies will be important to determine whether this PAG disinhibition mechanism contributes to the antinociceptive effects of intra-PAG injection of substance P, neurotensin, and cholecystokinin. As in the case of PAG, a functional interaction between mGlu5 and CB1 receptors to modulate nociception takes place at the spinal cord and amygdala. It has been shown that the antihyperalgesic effect of WIN55,212-2 in rats submitted to unilateral loose ligation of a sciatic nerve is mediated through an interaction between CB1 and mGlu5 receptors in the spinal cord dorsal horn (Hama and Urban, 2004). Further studies demonstrated that DGLα colocalizes with the mGlu5 receptor at the postsynaptic sites of nociceptive spinal synapses and also that the CB1 receptor is present at the presynaptic excitatory axon terminals (Nyilas et al., 2009). Moreover, intrathecal activation of mGlu5 receptor at the lumbar level evoked endocannabinoid-mediated, stress-induced analgesia through 2-AG mobilization, suggesting a key role for 2-AG–mediated retrograde suppression of nociceptive transmission at the spinal level (Nyilas et al., 2009). mGlu5 and CB1 receptors also work cooperatively to promote analgesia in an arthritis pain model through a mechanism that involves CB1-mediated increase in mGlu5 receptor function in the medial prefrontal cortex with consequent inhibition of abnormally enhanced amygdala output in pain (Ji and Neugebauer, 2014). In addition, fear-conditioning analgesia is facilitated by CB1 receptor activation in the basolateral amygdala via a mechanism that involves the modulation of mGlu5 and GABA receptor signaling (Rea et al., 2013). Thus, mGlu5 and CB1 receptors work cooperatively in various brain substrates to modulate nociception. The crosstalk between mGlu5 and CB1 receptors is important for regulation of several physiologic events, including LTD and neurotransmitter release. Furthermore, the mGlu5/CB1 signalosome complex appears to play a major role in some conditions, such as nociception and FXS, which indicates that these G protein–coupled receptors are potential therapeutic targets. After the discovery of the functional interaction between mGlu5 and CB1 receptors, several studies have emerged aiming to elucidate the mechanisms involved in this process. Although it is clear that the formation of the signalosome containing mGlu5-Homer-PLCβ-DGLα is a key factor contributing to mGlu5-dependent mobilization of 2-AG and to the regulation of neurotransmission, more studies are needed to clarify the mechanisms and signaling pathways involved in this interaction. The authors thank Roenick P. Olmo and Alvaro G. Ferreira for insightful comments that significantly contributed to figure design. Wrote or contributed to the writing of the manuscript: Olmo, Ferreira-Vieira, Ribeiro. I.G.O. and T.H.F.-V. contributed equally to this work. This research was supported by the Fundação de Amparo a Pesquisa do Estado de Minas Gerais and the Conselho Nacional de Desenvolvimento Científico e Tecnológico. (1992) Molecular characterization of a novel metabotropic glutamate receptor mGluR5 coupled to inositol phosphate/Ca2+ signal transduction. J Biol Chem 267:13361–13368. (2009) The effects of fatty acid amide hydrolase inhibitors on maintenance of cocaine and food self-administration and on reinstatement of cocaine-seeking and food-taking behavior in rats. J Physiol Pharmacol 60:119–125. (2006) The endocannabinoid system promotes astroglial differentiation by acting on neural progenitor cells. J Neurosci 26:1551–1561. (2007) The CB1 cannabinoid receptor mediates excitotoxicity-induced neural progenitor proliferation and neurogenesis. J Biol Chem 282:23892–23898. (1995) Agonist mediated phosphorylation of metabotropic glutamate receptor 1 alpha by protein kinase C in permanently transfected BHK cells. Biochem Soc Trans 23:88S. (2013) Modulation of anxiety-like behavior by the endocannabinoid 2-arachidonoylglycerol (2-AG) in the dorsolateral periaqueductal gray. Behav Brain Res 252:10–17. (2001) Agonist-independent activation of metabotropic glutamate receptors by the intracellular protein Homer. Nature 411:962–965. (2002) Homer-dependent cell surface expression of metabotropic glutamate receptor type 5 in neurons. Mol Cell Neurosci 20:323–329. (2012) CB1 agonist ACEA protects neurons and reduces the cognitive impairment of AbetaPP/PS1 mice.JAD 30:439–459. (1997) Functional role of high-affinity anandamide transport, as revealed by selective inhibition. Science 277:1094–1097. (1984) Inositol trisphosphate, a novel second messenger in cellular signal transduction. Nature 312:315–321. (2005) The endocannabinoid signalling system: biochemical aspects. Pharmacol Biochem Behav 81:224–238. (2000) N-acyl-dopamines: novel synthetic CB(1) cannabinoid-receptor ligands and inhibitors of anandamide inactivation with cannabimimetic activity in vitro and in vivo. Biochem J 351:817–824. (1995) Stimulation of cannabinoid receptor CB1 induces krox-24 expression in human astrocytoma cells. J Biol Chem 270:13973–13980. (2004) Spatial memory, recognition memory, and the hippocampus. Proc Natl Acad Sci USA 101:14515–14520. (1995) Protein kinase B (c-Akt) in phosphatidylinositol-3-OH kinase signal transduction. Nature 376:599–602. (2013) Targeting the endocannabinoid system in the treatment of fragile X syndrome. Nat Med 19:603–607. (2005) Cannabinoid receptors in microglia of the central nervous system: immune functional relevance. J Leukoc Biol 78:1192–1197. (2000) Metabotropic glutamate receptors in acutely isolated hippocampal astrocytes: developmental changes of mGluR5 mRNA and functional expression. Glia 29:70–80. (2014) The potential therapeutic effects of THC on Alzheimer’s disease. J Alzheimers Dis 42:973–984. (1994) Effects of anandamide on cannabinoid receptors in rat brain membranes. Biochem Pharmacol 47:711–715. (2003) 3-[(2-Methyl-1,3-thiazol-4-yl)ethynyl]-pyridine: a potent and highly selective metabotropic glutamate subtype 5 receptor antagonist with anxiolytic activity. J Med Chem 46:204–206. (2011) FMRP stalls ribosomal translocation on mRNAs linked to synaptic function and autism. Cell 146:247–261. (2005) Periaqueductal grey CB1 cannabinoid and metabotropic glutamate subtype 5 receptors modulate changes in rostral ventromedial medulla neuronal activities induced by subcutaneous formalin in the rat. Neuroscience 134:269–281. (2006) Regulation of metabotropic glutamate receptor signaling, desensitization and endocytosis. Pharmacol Ther 111:260–271. (2008) Targeting the endocannabinoid system: to enhance or reduce? Nat Rev Drug Discov 7:438–455. (2009) The endocannabinoid system: its general strategy of action, tools for its pharmacological manipulation and potential therapeutic exploitation. Pharmacol Res 60:77–84. (2004) The endocannabinoid system and its therapeutic exploitation. Nat Rev Drug Discov 3:771–784. (1998) Biochemistry of the endogenous ligands of cannabinoid receptors. Neurobiol Dis 5 (6 Pt B):386–404. (2005) Endocannabinoid control of food intake and energy balance. Nat Neurosci 8:585–589. (2007) Endocannabinoids and the regulation of their levels in health and disease. Curr Opin Lipidol 18:129–140. (2002) Brain monoglyceride lipase participating in endocannabinoid inactivation. Proc Natl Acad Sci USA 99:10819–10824. (1997) (RS)-2-Chloro-5-hydroxyphenylglycine (CHPG) activates mGlu5, but no mGlu1, receptors expressed in CHO cells and potentiates NMDA responses in the hippocampus. Neuropharmacology 36:265–267. (2015) The mGluR5 positive allosteric modulator, CDPPB, ameliorates pathology and phenotypic signs of a mouse model of Huntington’s disease. Neurobiol Dis 73:163–173. (2013) Metabotropic glutamate receptor 5 positive allosteric modulators are neuroprotective in a mouse model of Huntington’s disease. Br J Pharmacol 169:909–921. (2009) Substance P drives endocannabinoid-mediated disinhibition in a midbrain descending analgesic pathway. J Neurosci 29:7220–7229. (2008) Glutamate spillover modulates GABAergic synaptic transmission in the rat midbrain periaqueductal grey via metabotropic glutamate receptors and endocannabinoid signaling. J Neurosci 28:808–815. (1992) Homosynaptic long-term depression in area CA1 of hippocampus and effects of N-methyl-D-aspartate receptor blockade. Proc Natl Acad Sci USA 89:4363–4367. (2003) Comparative analysis of fatty acid amide hydrolase and cb(1) cannabinoid receptor expression in the mouse brain: evidence of a widespread role for fatty acid amide hydrolase in regulation of endocannabinoid signaling. Neuroscience 119:481–496. (2015) Group I metabotropic glutamate receptors: a potential target for regulation of proliferation and differentiation of an immortalized human neural stem cell line. Basic Clin Pharmacol Toxicol 116:329–336. (1993) Anandamide, an endogenous cannabimimetic eicosanoid, binds to the cloned human cannabinoid receptor and stimulates receptor-mediated signal transduction. Proc Natl Acad Sci USA 90:7656–7660. (2014) A role for the endocannabinoid system in exercise-induced spatial memory enhancement in mice. Hippocampus 24:79–88. (2010) Endocannabinoid-mediated modulation of stress responses: physiological and pathophysiological significance. Immunobiology 215:629–646. (1996) Activation of group I mGluRs potentiates NMDA responses in rat hippocampal slices. Neurosci Lett 203:211–213. (1999) DHPG-induced LTD in area CA1 of juvenile rat hippocampus; characterisation and sensitivity to novel mGlu receptor antagonists. Neuropharmacology 38:1577–1583. (1999) 2-Methyl-6-(phenylethynyl)-pyridine (MPEP), a potent, selective and systemically active mGlu5 receptor antagonist. Neuropharmacology 38:1493–1503. (2015) A Basal tone of 2-arachidonoylglycerol contributes to early oligodendrocyte progenitor proliferation by activating phosphatidylinositol 3-kinase (PI3K)/AKT and the mammalian target of rapamycin (MTOR) pathways. J Neuroimmune Pharmacol 10:309–317. (2012) Activation of type 5 metabotropic glutamate receptors and diacylglycerol lipase-α initiates 2-arachidonoylglycerol formation and endocannabinoid-mediated analgesia. J Neurosci 32:9457–9468. (2003) Acute activation of the spinal cord metabotropic glutamate subtype-5 receptor leads to cold hypersensitivity in the rat. Neuropharmacology 44:423–430. (2004) Antihyperalgesic effect of the cannabinoid agonist WIN55,212-2 is mediated through an interaction with spinal metabotropic glutamate-5 receptors in rats. Neurosci Lett 358:21–24. (2001) 2-Arachidonyl glyceryl ether, an endogenous agonist of the cannabinoid CB1 receptor. Proc Natl Acad Sci USA 98:3662–3665. (1997) Accumulation of N-arachidonoylethanolamine (anandamide) into cerebellar granule cells occurs via facilitated diffusion. J Neurochem 69:631–638. (1999) Synthesis and characterization of potent and selective agonists of the neuronal cannabinoid receptor (CB1). J Pharmacol Exp Ther 289:1427–1433. (2004) Activation of the phosphoinositide 3-kinase-Akt-mammalian target of rapamycin signaling pathway is required for metabotropic glutamate receptor-dependent long-term depression. J Neurosci 24:6352–6361. (2008) Roles of endocannabinoids in heterosynaptic long-term depression of excitatory synaptic transmission in visual cortex of young mice. J Neurosci 28:7074–7083. (2001) Chemical induction of mGluR5- and protein synthesis--dependent long-term depression in hippocampal area CA1. J Neurophysiol 86:321–325. (2015) Environmental enrichment improves learning and memory and long-term potentiation in young adult rats through a mechanism requiring mGluR5 signaling and sustained activation of p70s6k. Neurobiol Learn Mem 125:126–134. (1992) 3,5-Dihydroxyphenyl-glycine: a potent agonist of metabotropic glutamate receptors. Neuroreport 3:1013–1016. (2012) NMDA receptors, mGluR5, and endocannabinoids are involved in a cascade leading to hippocampal long-term depression. Neuropsychopharmacology 37:609–617. (2014) CB1 augments mGluR5 function in medial prefrontal cortical neurons to inhibit amygdala hyperactivity in an arthritis pain model. Eur J Neurosci 39:455–466. (2009) Intracellular metabotropic glutamate receptor 5 (mGluR5) activates signaling cascades distinct from cell surface counterparts. J Biol Chem 284:35827–35838. (2007) A key role for diacylglycerol lipase-alpha in metabotropic glutamate receptor-dependent endocannabinoid mobilization. Mol Pharmacol 72:612–621. (2012) Uncoupling of the endocannabinoid signalling complex in a mouse model of fragile X syndrome. Nat Commun 3:1080. (2012) The orthosteric agonist 2-chloro-5-hydroxyphenylglycine activates mGluR5 and mGluR1 with similar efficacy and potency. BMC Pharmacol 12:6. (2015) Emerging structural insights into the function of ionotropic glutamate receptors. Trends Biochem Sci 40:328–337. (2008) Endocannabinoid signaling as a synaptic circuit breaker in neurological disease. Nat Med 14:923–930. (2011) Inhibition of fatty acid amide hydrolase unmasks CB1 receptor and TRPV1 channel-mediated modulation of glutamatergic synaptic transmission in midbrain periaqueductal grey. Br J Pharmacol 163:1214–1222. (2004) Hippocampal long-term depression and long-term potentiation encode different aspects of novelty acquisition. Proc Natl Acad Sci USA 101:8192–8197. (2005) A novel selective positive allosteric modulator of metabotropic glutamate receptor subtype 5 has in vivo activity and antipsychotic-like effects in rat behavioral models. J Pharmacol Exp Ther 313:199–206. (2007) Molecular components and functions of the endocannabinoid system in mouse prefrontal cortex. PLoS One 2:e709. (2011) Capsaicin in the periaqueductal gray induces analgesia via metabotropic glutamate receptor-mediated endocannabinoid retrograde disinhibition. Br J Pharmacol 163:330–345. (2011) CTEP: a novel, potent, long-acting, and orally bioavailable metabotropic glutamate receptor 5 inhibitor. J Pharmacol Exp Ther 339:474–486. (1993) Activation of metabotropic glutamate receptors induces long-term depression of GABAergic inhibition in hippocampus. J Neurophysiol 69:1000–1004. (1991) Calcium entry increases the sensitivity of cerebellar Purkinje cells to applied GABA and decreases inhibitory synaptic currents. Neuron 6:565–574. (2009) Selective blockade of 2-arachidonoylglycerol hydrolysis produces cannabinoid behavioral effects. Nat Chem Biol 5:37–44. (1996) Perisynaptic location of metabotropic glutamate receptors mGluR1 and mGluR5 on dendrites and dendritic spines in the rat hippocampus. Eur J Neurosci 8:1488–1500. (2010) Abnormal mGlu 5 receptor/endocannabinoid coupling in mice lacking FMRP and BC1 RNA. Neuropsychopharmacology 35:1500–1509. (2006) Elevation of endocannabinoid levels in the ventrolateral periaqueductal grey through inhibition of fatty acid amide hydrolase affects descending nociceptive pathways via both cannabinoid receptor type 1 and transient receptor potential vanilloid type-1 receptors. J Pharmacol Exp Ther 316:969–982. (2015) Distinct subsynaptic localization of type 1 metabotropic glutamate receptors at glutamatergic and GABAergic synapses in the rodent cerebellar cortex. Eur J Neurosci 41:157–167. (2005) The scaffold protein Homer1b/c links metabotropic glutamate receptor 5 to extracellular signal-regulated protein kinase cascades in neurons. J Neurosci 25:2741–2752. (1995) An examination of the central sites of action of cannabinoid-induced antinociception in the rat. Life Sci 56:2103–2109. (2016) CB1 receptor antagonism blocks stress-potentiated reinstatement of cocaine seeking in rats. Psychopharmacology (Berl) 233:99–109. (1967) Recent advances in the chemistry of hashish. Fortschr Chem Org Naturst 25:175–213. (2012) Chronic pharmacological mGlu5 inhibition corrects fragile X in adult mice. Neuron 74:49–56. (2011) Cholecystokinin exerts an effect via the endocannabinoid system to inhibit GABAergic transmission in midbrain periaqueductal gray. Neuropsychopharmacology 36:1801–1810. (2009) Neurotensin inhibition of GABAergic transmission via mGluR-induced endocannabinoid signalling in rat periaqueductal grey. J Physiol 587:2511–2520. (2002) Cannabinoids promote oligodendrocyte progenitor survival: involvement of cannabinoid receptors and phosphatidylinositol-3 kinase/Akt signaling. J Neurosci 22:9742–9753. (2004) Cyclohexylcarbamic acid 3′- or 4′-substituted biphenyl-3-yl esters as fatty acid amide hydrolase inhibitors: synthesis, quantitative structure-activity relationships, and molecular modeling studies. J Med Chem 47:4998–5008. (2012) Dynamic remodeling of scaffold interactions in dendritic spines controls synaptic excitability. J Cell Biol 198:251–263. (1999) Cannabinoids and neuroprotection in global and focal cerebral ischemia and in neuronal cultures. J Neurosci 19:2987–2995. (1992) Molecular diversity of glutamate receptors and implications for brain function. Science 258:597–603. (1994) Molecular diversity and functions of glutamate receptors. Annu Rev Biophys Biomol Struct 23:319–348. (2014) Genetic rescue of CB1 receptors on medium spiny neurons prevents loss of excitatory striatal synapses but not motor impairment in HD mice. Neurobiol Dis 71:140–150. (1994) Subsynaptic segregation of metabotropic and ionotropic glutamate receptors as revealed by immunogold localization. Neuroscience 61:421–427. (2009) Molecular architecture of endocannabinoid signaling at nociceptive synapses mediating analgesia. Eur J Neurosci 29:1964–1978. (2002) Cooperative endocannabinoid production by neuronal depolarization and group I metabotropic glutamate receptor activation. Eur J Neurosci 15:953–961. (2007) Regulation of PI3K/Akt/GSK-3 pathway by cannabinoids in the brain. J Neurochem 102:1105–1114. (2000) The non-competitive antagonists 2-methyl-6-(phenylethynyl)pyridine and 7-hydroxyiminocyclopropan[b]chromen-1a-carboxylic acid ethyl ester interact with overlapping binding pockets in the transmembrane region of group I metabotropic glutamate receptors. J Biol Chem 275:33750–33758. (2012) Changes in cannabinoid receptor subtype 1 activity and interaction with metabotropic glutamate subtype 5 receptors in the periaqueductal gray-rostral ventromedial medulla pathway in a rodent neuropathic pain model. CNS Neurol Disord Drug Targets 11:148–161. (2001) Metabotropic and NMDA glutamate receptors participate in the cannabinoid-induced antinociception. Neuropharmacology 40:319–326. (2006) Metabotropic glutamate and cannabinoid receptor crosstalk in periaqueductal grey pain processing. Curr Neuropharmacol 4:225–231. (1997) The group I mGlu receptor agonist DHPG induces a novel form of LTD in the CA1 region of the hippocampus. Neuropharmacology 36:1517–1532. (1998) Arachidonylethanolamide (AEA) activation of FOS proto-oncogene protein immunoreactivity in the rat brain. Brain Res 797:225–233. (1975) Pharmacology of marijuana. Annu Rev Pharmacol 15:191–220. (2015) Chronic cannabinoid receptor stimulation selectively prevents motor impairments in a mouse model of Huntington’s disease. Neuropharmacology 89:368–374. (1994) Depolarization-induced suppression of GABAergic inhibition in rat hippocampal pyramidal cells: G protein involvement in a presynaptic mechanism. Neuron 13:1447–1455. (2002) Characterization of a novel endocannabinoid, virodhamine, with antagonist activity at the CB1 receptor. J Pharmacol Exp Ther 301:1020–1024. (2009) WIN55,212-2, a cannabinoid receptor agonist, protects against nigrostriatal cell loss in the 1-methyl-4-phenyl-1,2,3,6-tetrahydropyridine mouse model of Parkinson’s disease. Eur J Neurosci 29:2177–2186. (2013) Evidence for a role of GABAergic and glutamatergic signalling in the basolateral amygdala in endocannabinoid-mediated fear-conditioned analgesia in rats. Pain 154:576–585. (2009) Phosphorylation-independent regulation of metabotropic glutamate receptor 5 desensitization and internalization by G protein-coupled receptor kinase 2 in neurons. J Biol Chem 284:23444–23453. (2010) Metabotropic glutamate receptor-mediated cell signaling pathways are altered in a mouse model of Huntington’s disease. J Neurosci 30:316–324. (1999) Homer 1b regulates the trafficking of group I metabotropic glutamate receptors. J Biol Chem 274:25953–25957. (2003) PI3 kinase enhancer-Homer complex couples mGluRI to PI3 kinase, preventing neuronal apoptosis. Nat Neurosci 6:1153–1161. (2011) Allosteric modulation of metabotropic glutamate receptors. Adv Pharmacol 62:37–77. (2002) Postsynaptic signaling and plasticity mechanisms. Science 298:776–780. (1993) Immunohistochemical localization of a metabotropic glutamate receptor, mGluR5, in the rat brain. Neurosci Lett 163:53–57. (2007) The Homer family proteins. Genome Biol 8:206. (2005) The activation of Akt/PKB signaling pathway and cell survival. J Cell Mol Med 9:59–71. (2007) Tonic endovanilloid facilitation of glutamate release in brainstem descending antinociceptive pathways. J Neurosci 27:13739–13749. (2001) Activation of group I mGluRs is necessary for induction of long-term depression at striatal synapses. J Neurophysiol 86:2405–2412. (2015) Homer protein-metabotropic glutamate receptor binding regulates endocannabinoid signaling and affects hyperexcitability in a mouse model of fragile X syndrome. J Neurosci 35:3938–3945. (1998) Fatty acid amide hydrolase is located preferentially in large neurons in the rat central nervous system as revealed by immunohistochemistry. Neurosci Lett 254:137–140. (1999) Coupling of mGluR/Homer and PSD-95 complexes by the Shank family of postsynaptic density proteins. Neuron 23:583–592. (1998) Homer binds a novel proline-rich motif and links group 1 metabotropic glutamate receptors with IP3 receptors. Neuron 21:717–726. (2001) Metabotropic glutamate receptors drive the endocannabinoid system in hippocampus. J Neurosci 21:RC188. (1991) Identification of a gene (FMR-1) containing a CGG repeat coincident with a breakpoint cluster region exhibiting length variation in fragile X syndrome. Cell 65:905–914. (2015) Enhancement of endocannabinoid signaling protects against cocaine-induced neurotoxicity. Toxicol Appl Pharmacol 286:178–187. (1993) Anandamide, a brain endogenous compound, interacts specifically with cannabinoid receptors and inhibits adenylate cyclase. J Neurochem 61:352–355. (2015) Inhibition of monoacylglycerol lipase mediates a cannabinoid 1-receptor dependent delay of kindling progression in mice. Neurobiol Dis 77:238–245. (2009) Biology of endocannabinoid synthesis system. Prostaglandins Other Lipid Mediat 89:112–119. (2007) Regulation of mitogen-activated protein kinases by glutamate receptors. J Neurochem 100:1–11. (1993) Metabotropic glutamate receptors trigger postsynaptic protein synthesis. Proc Natl Acad Sci USA 90:7168–7171. (2015) Acute administration of a cannabinoid CB1 receptor antagonist impairs stress-induced antinociception in fish. Physiol Behav 142:37–41. (1998) Homer regulates the association of group 1 metabotropic glutamate receptors with multivalent complexes of homer-related, synaptic proteins. Neuron 21:707–716. (1997) Behavioural and electrophysiological evidence supporting a role for group I metabotropic glutamate receptors in the mediation of nociceptive inputs to the rat spinal cord. Brain Res 777:161–169. (2010) Enhanced endocannabinoid signaling elevates neuronal excitability in fragile X syndrome. J Neurosci 30:5724–5729. (2015) Blockade of 2-arachidonoylglycerol hydrolysis produces antidepressant-like effects and enhances adult hippocampal neurogenesis and synaptic plasticity. Hippocampus 25:16–26.